ESL teacher Elizabeth Leone and her students wrote and designed a book on Manchester's "community assets." 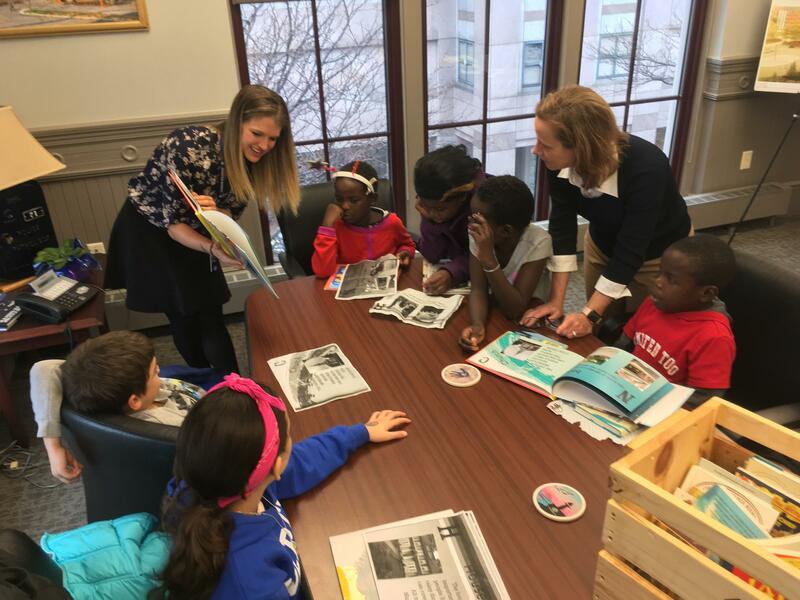 Manchester Mayor Joyce Craig got an early holiday present on Monday from a group of Webster Elementary School English language learners. The students presented a book they've been preparing for the last few months in their immersive all-day ESL class. The book opens with the words "We are Manchester Proud" and a photo of the students, who moved here within the last year from countries in Africa, the Middle East, and Latin America. After that, there are pages of photos of their new city, Manchester, that the students took themselves on walking tours. Pointing out pictures of the fire station and the supermarket, English teacher Elizabeth Leone, explains this hands-on learning process, called "project-based learning" or "PBL." 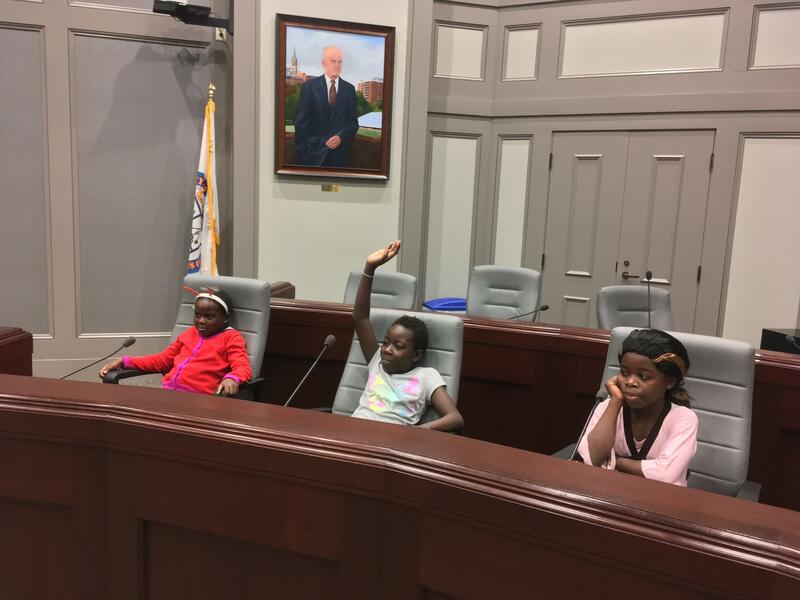 Webster Elementary School Students try out the alderman's chairs in Manchester's City Hall. "Their learning happens by exploring ," she says. "And that's where their language learning happens too." The method is growing in Manchester, thanks to a grant from the Buck Institute For Education, which awarded nearly $2 million to the Manchester School District and a school district in Hawaii for training and research into the method. The Buck Institute has trained 245 teachers in Manchester since the three-year grant began in early 2018. Leone says she's one of the first ESL teachers in Manchester to incorporate PBL into her classroom. She says it works for her students. "They're engaged, and they're loving it, and they almost don't even know they're learning," she says, "But they're taking risks, taking chances, and getting involved." Click here for Leone's presentation on PBL for English language learners. Wednesday night, the Manchester school board will vote on proposals that would change how students move from one school to another. This overhaul of what's known as the feeder pattern is just one part of a larger redistricting process that the city has been struggling to accomplish for nearly a decade. NHPR reporter Jason Moon spoke with All Things Considered host Peter Biello about the process, and why it's been so fraught for so long. White Mountains Regional High School in Whitefield is surrounded by woods, and snow capped Mount Washington looms not far away. A little ways from the school is a small field, filled with the bare bones of hand made shelters. Aidan Wiggin’s a science teacher, and she gives me a tour of what her 9th and 10th grade students are building.